Can't wait for the review of the upcoming Super Sentai transformation device/weapon? Well here's our lucky day as a Japanese youtube toy reviewer shares his demo video for the DX Double Transformation Gun VS Changer! 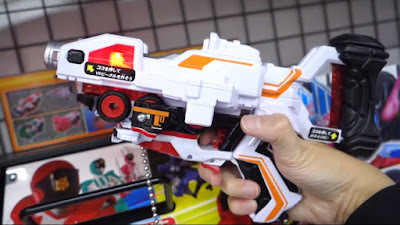 The DX Double Transformation Gun VS Changer (4,536 yen) will be released on the end of February and will come in 2 versions, the Lupinranger (which contains the Red Dial Fighter) and Patranger (Trigger Machine 1) version.